Okay here's the loot picture Blogger wouldn't post from yesterday. I remembered a tip someone (Shelina maybe???) posted that said when blogger says the photo is done but it doesn't show up, copy and past the html from a previous post and change the photo name at both places in the code to the one you're trying to show and your picture will show up. And it did. :-) So thanks to whoever posted that tip! The book and fabrics at the top of the photo are my kit. With the addition of 6 or 8 more fqs from my stash. I forgot I had already blended them together before I took the picture. I've now finished sewing all my squares into groups of 3. Tonight I can start sewing those into strips of 14 and 17. Those fabrics look scrummy! I will love seeing what you do with them! I love your new motto, I'd like to use it too if I may. The selection of FQ's is wondeerful. I will await the picture of the quilt you just started. Good to hear from you again. I love that fabric you have as the main one - I have some in green and crimson, and a blue one. Kensington I think. Good to see you back Nancy - it seems like longer than 2 weeks. 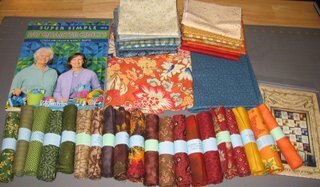 yummy fabrics--in fall colors. I love the fall and all the colors that go with it. your little motto reminds me of the one that was so hard to get out of your head once you started humming it....don't worry, be happy! And you should be happy--and if taking your good old time, enjoying every bit of each process is the way to do it, go for it! The FQ's are wonderfull. I am sure there will come out a beautifull quilt. great goodies there in the picture.. love that motto! LOL its a good one! Beautiful stuff! You did good on your shopping excursion! I've missed you. Happy that you're back at the sewing machine - with no dreaded deadlines! Yummy! Nice to see you back, and in such good color, lol! nice to see you again Nancy. Those fabrics are just beautiful. Can't wait to see what you do with them. P.S.... New pictures of ashley on Bob's website... www.bobsdigital.com, press the enter button then, she and her teen queen Sydney have a link on the front page. great new project Nancy-whatever helps you enjoy your love of quilting is a very good thing! I know exactly what you mean by sitting around and feeling depressed at not getting projects done faster. As long as we need to work outside the home-we will just have less time to enjoy quilting, but it WON'T always be that way!!! thank goodness. GREAT Fabrics Nancy! I can hardly wait to see your project! I also love your new motto: No hurries - No Worries...I just might have to adopt it! Thanks for the post on my blog! Look at all those pretty new fabrics! If they don't help to get your creative juices flowing again, you might need professional help!